Another holiday season means my semi-annual Holiday Gift Guide, which I think is more like a gift recommendation than a guide since I put personal experience behind each of these items. If you are still looking for more gift ideas (this year it is short), check out my previous lists. I still believe in all those products and are items you can still purchase. I will go back and update links, but try a google search if any don’t work. (2016, 2015, 2013). Also, only one item on the list is over $100 so all the items are reasonable price points (most are under $30). This fragrance recalls personal memories of dear friends, garden designer Jon Carlofits and Dale Fisher and is our favorite candle to burn at home all year round. I don’t like fruity or foodie fragrances (drinks themed is a different story), and this fragrance has presence but is not too heavy. 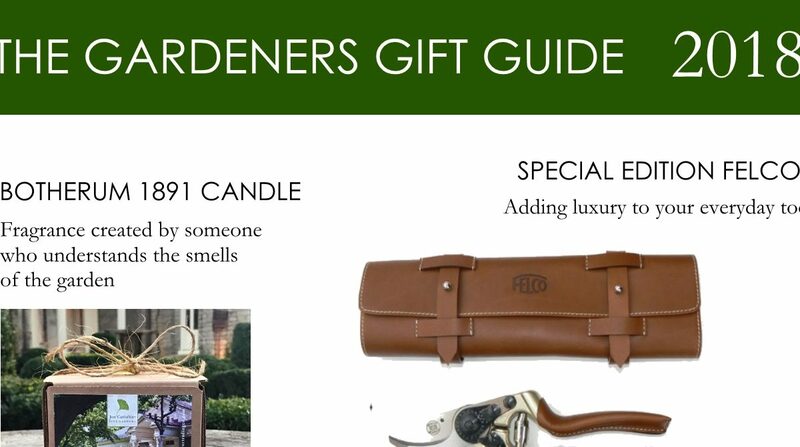 I think since the fragrances are created by a gardener, they have the right notes for fellow green thumbs so I don’t think you will go wrong with any of the fragrances. I know I reviewed this earlier (HERE), but I just picked it back up over Thanksgiving and was reminded how much I learned from the book. It is a great gift for anyone interested in gardening, it has beautiful imagery aligned with expert advise for the gardener or explaining the process for someone hiring a professional designer. As a bonus the Garden Conservancy has announced a 2019 tour with Jinny in four US cities. Could be a great combo gift if you are fortunate enough live in those areas. See details HERE. I normally don’t recommend plants/seeds as a gift to another gardener since that is like giving someone unsolicited artwork. However, I had such a great time growing these Dr Seuss like seed pods, they are worth the recommendation for other gardeners. This year was my first time growing Asclepias physocarpa (Gomphocarpus physocarpus) and placed them in our cutting garden. The plants grew to over 8 feet tall and James, my son, loved them since the plant is poisonous (right up there with Castor Bean for his excitement). We ended up not cutting any stems for inside the house as planned, however, we did enjoy it in the garden. This was due in part to our monarch butterfly larvae who loved these robust plants after they had devoured our Asclepias incarnata ‘Ice Ballet‘ food supply. It will make a repeat appearance next year! I mean what is not to love when a plant is called “Family Jewels Plant”? I think a Hori Hori knife (or soil knife) is an indispensable garden tool for cutting trough tough soil, twine, roots, containers, to name just a few tasks. This versatility of a Hori Hori knife requires one that is strong and will hold up as you put it through its gardening paces. I found this knife in a store up in Cleveland and it had a great weight to the steel blade and feels good in the hand. I just ordered mine from Barebones with a great Cyber Monday deal, but at everyday price of $50, it is a good value. I picked up the Beer bandanna while out down in Lexington, Kentucky this year, and have realized the benefits of carrying around a bandana in your back pocket. Like the Hori Hori knife, it is so versatile and this is an attractive design. The The graphic illustrates the process of distilling in the distillery collection. Beer, bourbon and wine which hits the poison of every gardener I know! 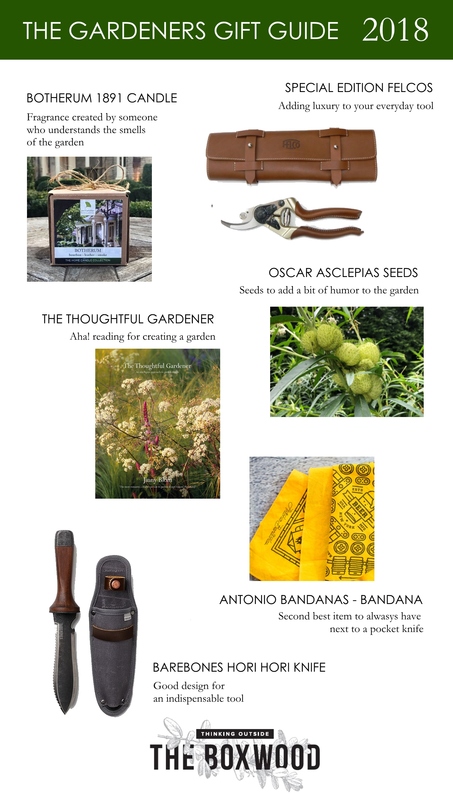 This entry was posted in G A R D E N S, gardening and tagged Antonio Bandanas, Antonio Bandanas - Beverage Collection Bandanas, Asclepias incarnata 'Ice Ballet', Asclepias physocarpa, Barebones Hori Hori Knife, Botherum 1851 Candle, Family Jewels Plant, Feclos Special Edition in Leather, Felco, gardener gifts, gifts for gardeners, Gomphocarpus physocarpus, Jinny Blom, Jon Carlofits, Oscar Milkweed Seeds, The Thoughtful Gardener by Nick. Bookmark the permalink.